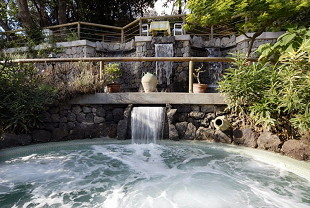 Swimming pool discovered with thermal water "36° rich in iron and sulphur, with a daily water change where it's possible to enjoy a healthy and pleasant hydromassage under the waterfall, covered thermal Swimming pool with hydromassage, turkish bath. 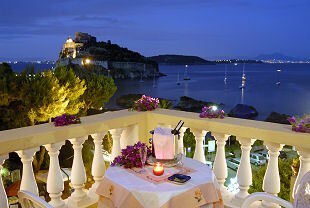 Solarium terraces with sea - view and equipped for sun treatment (heliotherapy). Central heating, Massage, small room with TV sat, Internet Point, A small beach below the hotel with clusters of rocks and sand, reachable through a path departing from the surroundings. 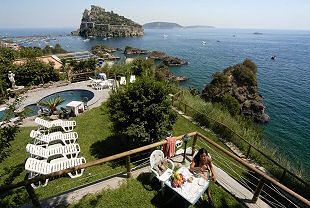 Terrazzi e parco giardino con mille angoli suggestivi attrezzati e funzionali per un perfetto relax, solarium attrezzati con lettini, godono di una splendida vista sul mare per cure elioterapeutiche. Restaurant Close with air conditioning and Open with panoramic terrace very appreciate for the typical fresh sea food taste and all local speciality, vegetable buffet, vegetarian menu, menu alla carte and standard menu. Half Board with buffet breakfast and dinner. Once for week gala night with animation. La Fenice, a small guesthouse is in a restful place, above the Hotel "Il Giardino delle Ninfe". Its rooms offer the same services. It could be possible to reach the guesthouse by foot - through the stairs inside the Hotel "Il Giardino delle Ninfe" - or by car - through a private street with parking. All the facilities are in the main hotel. From the hotel, many paths branch off from the hotel along the hillside where you could walk and discover many views of this lovely landscape.